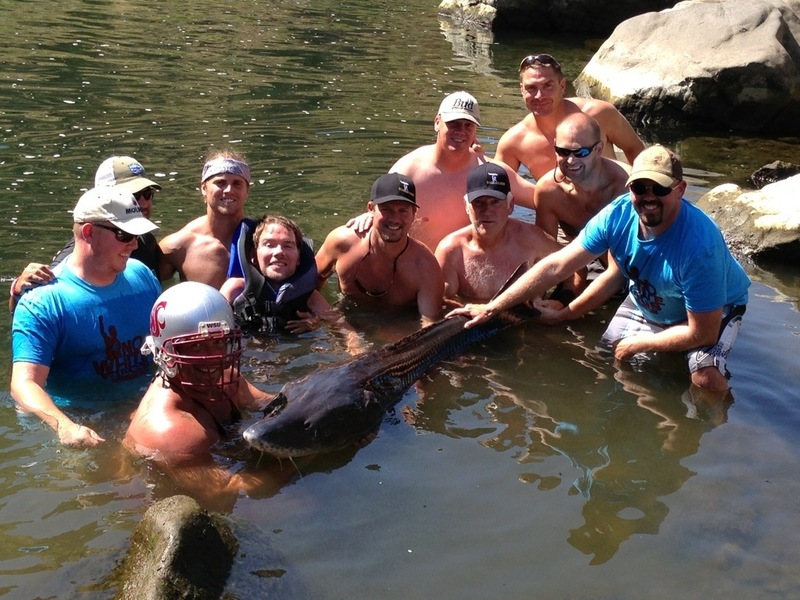 Steve and some his best friends from college (mostly baseball teammates from WSU) went on a Hells Canyon trip last year. Steve had so much fun that he wanted to go again this year, and take a fellow pALS. Ann Marie Byrd from The Catholic Charities of Spokane helped us find a candidate: Morgan Noesen. The trip was more difficult this year for Steve and crew because of his progression in the past year, but the trip turned out to be successful. Because. Awesome aint Easy. 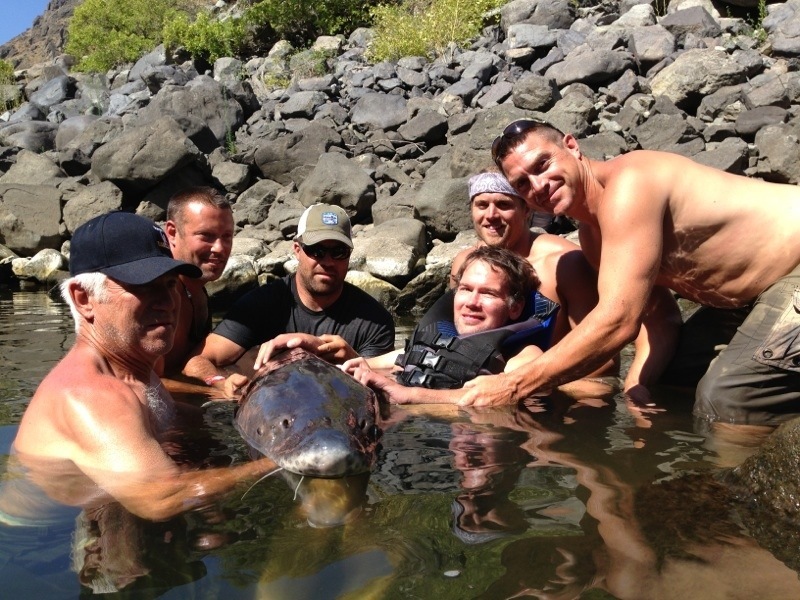 “I cannot begin to tell you how grateful I am for the opportunity to go to Hells Canyon with your crew! Obviously the scenery was awesome and the bass fishing, great. The trips up and down the river were beautiful, intense, and at times, scary (but in a fun way!) The impromptu soakings were the best! I could go on and on about the many things that made the trip fun, the trip of a lifetime; the monster sturgeon we caught, the great food and drink, the evening thunderstorm we got to watch in the distance, but that really isn’t what I came away from the trip with. I came away from the trip inspired, changed. I know that sounds cliche, but as a person fairly new to the world of neurological disorders, I have had a hard time wrapping my head around “the new me”, and the concept of what the “new me” will be tomorrow, next week, next year. I had the privilege of spending time with Steve, observing, and taking in his enormous spirit, positivity and perseverance in the face of tremendous adversity, and to see him smile through it all and keep on pushing through. If I can maintain even a fraction of that positive outlook, i’ll be doing well. Another take away from the trip for me was the incredible people, the friendships Steve has developed over the years, and their dedication to him. Not just him…I felt the care for me, too, even though they had just met me. It would have been very easy to feel like an outsider on a trip of this nature, but these guys weren’t having that. I was welcomed from minute one, and was made to feel a part of the group throughout. It’s funny, I don’t know why it took me until 2007, my first trip, to figure out that Hells Canyon is one of the most special places on Earth. As I’m sure Morgan or anyone else has felt on their first drive into the mouth of the canyon, you have no idea what you’re getting into. You really have no idea how peaceful and yet at the same time dangerous it can be.